Candido Camero was born in Havana, Cuba in 1921. He came to the United States in July of 1946 with the dance team, Carmen and Rolando. At that time, there was no bands using congas outside of Dizzy Gillespie who on December 3, 1947 created in collaboration with Cuban conga great, Chano Pozo, the tune Manteca. Dizzy took Candido to meet jazz pianist, Billy Taylor and after hearing him play, hired him to work at The Downbeat Club. Candido pioneered playing more than one percussion instrument at one time. In the early 1950's he was performing as a featured soloist with the Stan Kenton Orchestra using 3 congas, a guiro mounted to the a conga and a cowbell, attached to a bass drum pedal. 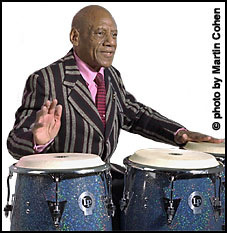 Candido is a musical giant hailed as one of the greatest Cuban percussionists to come to America. His musical gift is a powerful, driving force as he plays percussion with fingers that demonstrate technical ability with a love for music. Even when he performs alone on stage, the stage seems full. To learn more about Candido Camero, please CLICK HERE.